Io is intensely heated by its tidal interaction with Jupiter and is thus extremely volcanically active. That activity is evident in these images, which reveal an enormous dust plume, more than 150 miles high, erupting from the volcano Tvashtar. 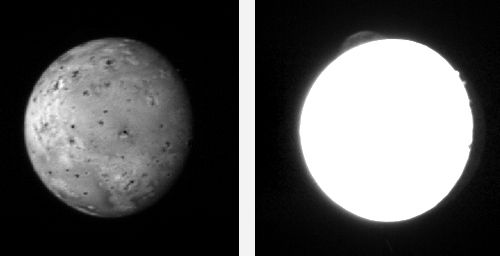 The plume appears as an umbrella-shaped feature of the edge of Io's disk in the 11 o'clock position in the right image, which is a long-exposure (20-millisecond) frame designed specifically to look for plumes like this. The bright spots at 2 o'clock are high mountains catching the setting sun; beyond them the night side of Io can be seen, faintly illuminated by light reflected from Jupiter itself. The left image is a shorter exposure � 3 milliseconds � designed to look at surface features. In this frame, the Tvashtar volcano shows as a dark spot, also at 11 o'clock, surrounded by a large dark ring, where an area larger than Texas has been covered by fallout from the giant eruption. This is the clearest view yet of a plume from Tvashtar, one of Io's most active volcanoes. Ground-based telescopes and the Galileo Jupiter orbiter first spotted volcanic heat radiation from Tvashtar in November 1999, and the Cassini spacecraft saw a large plume when it flew past Jupiter in December 2000. The Keck telescope in Hawaii picked up renewed heat radiation from Tvashtar in spring 2006, and just two weeks ago the Hubble Space Telescope saw the Tvashtar plume in ultraviolet images designed to support the New Horizons flyby. The New Horizons images of the plume � which show features as small as 20 kilometers (12 miles), are 12 times sharper than the Hubble images and about three times sharper than the Cassini images. "This is the best image of a large volcanic plume on Io since the Voyager flybys in 1979," says John Spencer, deputy leader of the New Horizons Jupiter Encounter Science Team from Southwest Research Institute. "If the Tvashtar plume remains active, the images we take later in the encounter should be even better." Most of those images will be stored onboard the spacecraft for downlink to Earth in March and April. "Ever wonder what it is like to see the images for the first time when they come down from the spacecraft? Join team members Andy Cheng and Hal Weaver at APL as they see the first images of Io from LORRI. They are also joined by team member John Spencer from Boulder, CO, on the phone to share the news."